The search continues for 8 year old missing Kerra Wilson. 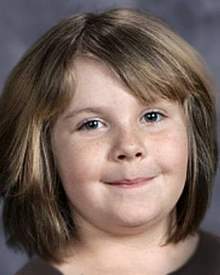 She was last seen at 8 AM, Wednesday, September 21, 2011 when her stepfather dropped her off for school at the Mitchell Elementary School in the Panhandle city of Mitchell, NE. Kirk Kuxhausen, the Mitchell Elementary School principal said that security cameras didn’t record any picture of Kerra inside the building or on the playground. Hmmm. Wednesday, Kerra was left at the west doors of Mitchell Elementary School by her stepfather Salvador Lopez, said Lt. Monica Bartling of the Nebraska State Patrol. Video from security cameras at the school and neighboring businesses recorded no images of the girl. “We know she did not enter the school,” Bartling said. Kerra Wilson was reported missing by her grandmother Wednesday afternoon at 3 pm. State police, the FBI and folks from the National Center for Missing & Exploited Children are participating in the search for missing Kerra Wilson. Kerra, daughter of Amanda Lopez, was described as 4-foot-2 and weighing 78 pounds. She has brown, shoulder-length hair with red streaks in it. She was wearing a sky blue short-sleeved shirt, possibly with white numbers or letters. If anyone has any information regarding the case of missing Kerra Wilson, please call the Scotts Bluff County Communications center at 308-436-6666, the Nebraska State Patrol at 308-632-1211 or the Omaha FBI office, 402-493-8688. For more updates, opinions and follow up on the case go to Scared Monkeys Missing Persons forum: Kerra Wilson. UPDATE II: Sadly, but not unexpected after hearing the news accounts that came forth in the case of missing 8 year old Kerra Wilson, she has been found dead. The body of Kerra Wilson has been found … stepfather Salvador Carlos Lopez arrested for first degree murder and sexual assault. Salvador Carlos Lopez, 32, was charged with first-degree murder in the death of Kerra Wilson, according to court documents. Investigators found Kerra’s body Thursday evening in a rugged area of Sioux County — miles away from the family’s home — after a rancher reported seeing something suspicious.